Note from Melissa: I thought it would be fun for Brad to pop in here and introduce himself to you guys. If you don't know Brad, he's a chemist by day, and a wood turner by night. Check out some of his stuff here. 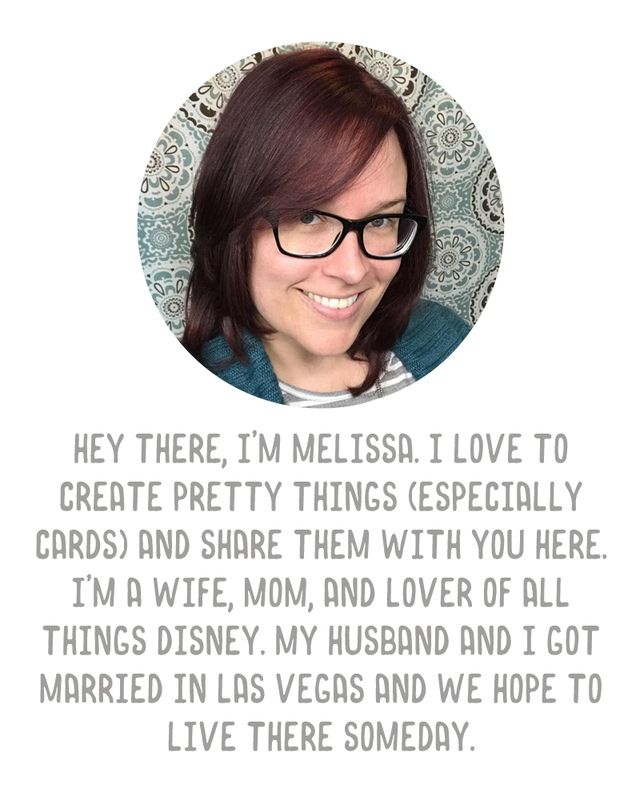 So, Melissa asked me to do a guest post. Not being much of a blogger I really wasn’t sure what to do. With funny posts by husbands of crafters having been done I decided to make this an informative post focusing on one of my hobbies. I do have a few hobbies. One of them developed over the past couple of years is grilling. I’m no grill master, far from it even, but I’m improving each time I fire up my grill. I have discovered some pretty tasty dishes over the past couple of years, many recreations of Steven Raichlen (a grill god if you’ve never heard of him and someone whose books I highly recommend if you grill). However, I have experimented some (that would be the scientist in me) so I thought today I’d pass along one of my own creations, an awesome pork loin recipe. Brining the pork loin adds additional flavor throughout the pork as the brining process infuses the different ingredients through osmosis. In a large bowl filled with enough water to cover the pork loin add the above ingredients. Stir to dissolve the salt. 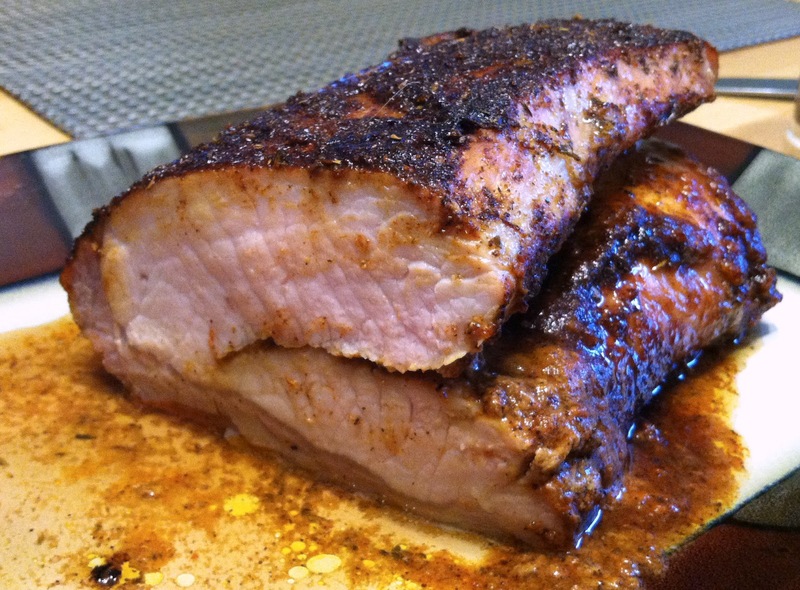 Place the pork loin in the brine mixture, cover, and place in the refrigerator for 4 to 6 hours. Remove the pork loin from the brine. Fillet cut the pork almost all the way through and open the pork like a book. On this inside cut spread a thin layer of the mustard. For this recipe I used El Diablo Hot and Spicy Steakhouse mustard. It has a nice kick but not too hot. On top of the mustard add a thin layer of brown sugar and spread in. On top of this add a layer of Memphis dry rub. Close up the pork. 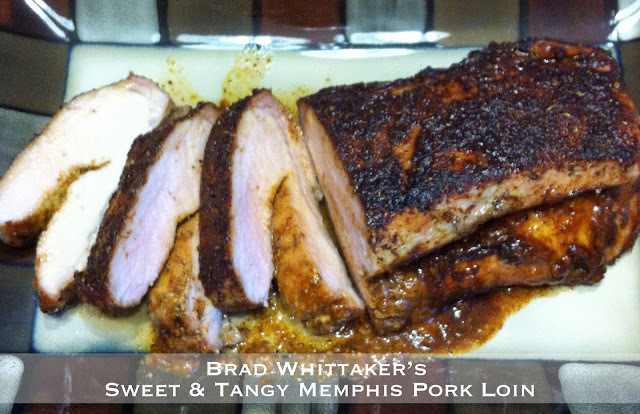 Turn the pork fat side up (if it has one) and apply a layer of Memphis rub and rub it in with your hand. Turn the pork over and rub in a layer of Memphis rub to the other side. Spread a small amount of the smoked bacon Cajun sea salt. Don’t use too much, sea salt is much stronger than table salt. On a side note I highly recommend just about anything from Saratoga Olive Oil Co. Visit their website, their stuff is amazing. Finally add a layer of smoked paprika. 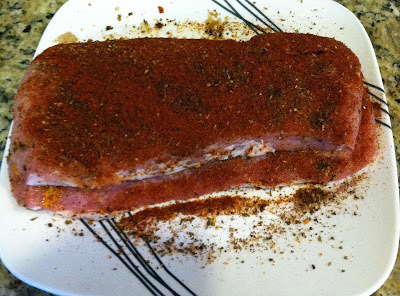 When done the pork loin will look like this. Combine the above ingredients. Stir until the brown sugar is dissolved. Set aside. 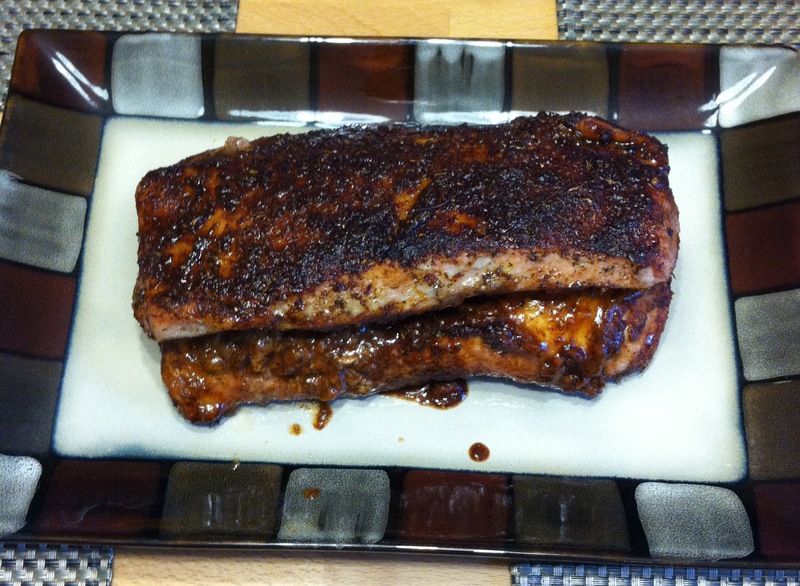 The pork loin is cooked with indirect grilling. This is a great technique to grill where the meat is not directly above the heat source. This allows for a slower cook without burning the bottom of the meat and no need to turn during cooking. I have a gas grill with four burners. I turn the left and right burner on and leave the two middle burners off. Adjust the grill temp to about 275 F. Place the pork in the center of the grill fat side down. This goes against most grilling techniques. They say fat side up so the fat juices fall into the meat and keep it moist. The problem with this is all that rub you applied gets lost on top of a fat layer you can’t eat. I grill this way and just add plenty of mop sauce to keep moist. Indirect grilling can also be done with a charcoal grill. Search the net for this set-up. There will be plenty of information on this. Grill the pork until the internal temp is between 145-150 F. For this pork that was about 90 minutes. Starting at 30 minutes and every 15 minutes until cooked, lightly apply a liberal amount of the sauce with either a mop brush or sprayer. Use caution not to wash off the rub. After removing the pork allow to sit for 3 to 5 minutes before cutting. This will allow the meat to relax and help keep moist. Combine all ingredients and mix by hand. Store in an air tight container. This stuff will last quite a while like this. OK, that’s my first guest post. A bit long but I do tend to ramble, I hope you enjoy the pork. Next time I’ll talk about a great grilled potato recipe that is a great compliment to this. Yum ! The prok looks delicious Brad. Thanks for the recipe. Or as I should have written pork lol. Great first guest post. Man alive! I wish Joel liked pork, because this looks phenomenal!